Almost any type of wood can be used for furniture, but the ones listed here are the most suitable, based on strength, durability, availability, and cost. The grain and color are classics that will probably "fit in" with other furniture. Some of the cheaper, softer woods are interesting, but are less durable. Some of the more exotic woods are beautiful - like creating a work of art - but you need to consider whether you want a unique "discussion piece" or a piece that blends with other furniture in the room. Many of the exotic woods are scarce enough to only be available as veneers. The chemistry of altering wood, as well as staining, dying, and otherwise coloring the wood, is advancing rapidly. In a recent visit to a furniture store, the walnut wood didn't have quite the right grain. The sales manager finally confessed that this company was using cherry for all their pieces this year, chemically removing all the color and recoloring it to look like whatever they wanted. I wonder what wood will be used next year for all their furniture! Factories can stain wood fairly economically, but it makes the furniture hard to repair. Although I have stained or dyed many pieces, I have gradually become opposed to the process... it adds a lot of time(cost), hides some of the natural beauty of the wood, and makes repair far more difficult. Coloring a cheap wood to look like a more expensive wood often costs more than just using the good wood in a piece of custom furniture. In addition to the information below about the primary furniture wood, you may also be interested in Secondary Wood that is part of practically every piece of furniture. You may also want to consider decorations, the way wood is cut into lumber, and other choices. Most of the pictures of the wood below were obtained from others. They seem to be good representations of each wood, but wood does vary, and pictures vary, as do the computers that are used to view these pictures, so they should only be used as a general guideline, not a guarantee. The difference in the total cost of the project between the cheapest and most expensive common furniture woods may only be 10-20%. Some of the difference is the cost of the wood itself, but also the amount of waste... sometimes it is hard to find larger pieces because of knots and sapwood. If you would like one of the "more expensive" common woods, I urge you to make the slight extra investment. Oak is popular in kitchens, floors, and other cabinets. Most oak is not stained, but the finished wood (or the clear finish used on the wood) tends to yellow slightly over time. It is very hard and durable. The tan color of oak "Arts and Crafts" furniture is from fuming white oak - exposing the bare wood to ammonia which reacts with the natural tannin in the wood - rather than from stain. Red Oak, in the upper picture, is the most common oak, which has a slight pink tint. It is quite porous (thus is suitable for indoor use only). Traditionally the pores are not filled, and a clear finish such as lacquer or varnish is applied. If you have oak floors or staircase, and are not sure what kind of oak it is, bet on red oak. It is an excellent furniture wood, and probably the lowest cost wood for most projects. White oak, shown as a stained or fumed wood in the lower picture, is less porous as well as less pink, and can be used for outdoor projects as well as indoor furniture. Oak barrels are always white oak - the open pores of red oak would leak. The "medullary rays" going across the grain are present in all oak, and are especially common in quarter sawn white oak. These are one of the defining characteristics of arts and crafts furniture. Ash is very similar to oak, but without medullary rays - see below. Ash is a very strong wood, often used for baseball bats and handles of tools. It is relatively inexpensive, sometimes even being used for residential wood trim, or for commercial "unpainted" furniture. Looks a lot like oak, with strong open grain and light color. Local availability is sometimes sporadic, but I will be glad to check if you want a project done in Ash. Walnut, also known as "American Walnut" or "Black Walnut" is our favorite "dark" furniture wood. The heartwood is a rich brown. Knots larger than "pin" size are normally avoided. The outer sapwood is lighter, varying from the light brown to a much lighter cream or white. Large walnut trees are becoming scarce, so the available walnut wood has more sapwood. Some people love the character that the sapwood adds. When it can't be hidden on the inside, bottom, or back of the piece, I may dye the sapwood so it isn't as obvious. Some walnut is steamed in the kiln before it is dried, which makes the sapwood turn brown, like it eventually would as the tree grew longer and the sapwood matured to heartwood. Walnut is quite hard and durable - resistant to dings. The slightly open grain of walnut can be filled for a smooth polished finish, or walnut can left "open" so the texture of the wood projects through the finish. The natural brown color can be relatively light, like our logo at the top of the page. Some of my earlier walnut pieces were stained a darker walnut. If you are uncertain, leave the wood natural - not only does the pretty grain show better, but the furniture can be repaired more easily if that is ever required. Walnut can be used in dishes and cutting boards - the finished wood is not toxic, although the sawdust is slightly irritating when working with it (my problem, not yours). As a side note, the sawdust prevents seeds from germinating but does not interfere with plant growth, so I save my walnut sawdust for friends to use as mulch on their rose gardens. Cherry is another favorite furniture wood. 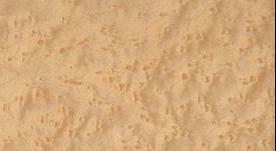 Initially it is a very light brown, with occasional small knots or sap pockets (larger flaws are avoided). As it is exposed to light, it gradually darkens, with obvious change in the first few weeks. In months it will become a rich light brown, and in a year or two it will be a medium brown. It will probably never become the classic "dark cherry" which was caused by old fashioned finishes darkening as much as the wood. See the separate example of how cherry darkens. The wood can be stained or dyed so that it starts darker (the more traditional furniture color), but the underlying wood will continue to darken over time. Therefore the stain that today might be a perfect color match to some previously finished wood, probably will not be an exact match in a few months. If the old and new pieces are both left unstained, the colors will gradually become similar. This picture is a piece of wood we actually prepared, with oil but no stain, about 6 months before the picture was taken. If you want a traditional "dark cherry" look immediately, some people suggest staining or dying maple or birch (the grain patterns are similar, and the wood is less expensive) to get the cherry look with less later change in the color. If you want the look of real cherry, we recommend no stain or dye at all. A friend with cherry bookcases noted that the less-frequently-moved books on the shelf had created a pattern in the wood - the books had prevented sunlight from darkening the shelf under the books so the outline of those books showed (but the outline gradually faded when the books were moved). The change is slow enough so that a magazine on a table is not a problem but a piece of art that is "always" in the same place may leave a lighter spot. Cherry has great color, strength, and is relatively hard - resistant to dings. (Some people avoid using in in flooring, because it is slightly softer than other traditional floor woods, but it can be a beautiful floor wood also.) It has a beautiful even grain, and is beautiful with either an oiled finish or a hard lacquer or varnish surface. The wood is not toxic - it can be used in wooden dishes. Maple comes in many varieties, but generally is a very hard wood, that makes beautiful durable furniture. Maple has a small, darker heart, but is prized for the very light and even sapwood - the opposite of most wood where the heartwood is preferred. "Soft" maple is quite hard - harder than many of the other "hard" woods, and is more prone to the distinctive brown mineral streaks in the lower-left picture. Most commercial maple furniture is stained another color, often a honey brown, like the lower right picture. The wood is non toxic (it's sap becomes maple syrup) and is often used for cutting boards. Maples, especially harder maples, sometimes have a distinctive curly grain. Birds eye maple is a premium piece of maple that has small circular grain patterns, among the regular grain - see below among the exotic woods. Other interesting grain patterns are available as well. It is often used in musical instruments (like the back of violins - fiddleback). Regular pieces of maple may have occasional hints of the curly or birds eye features. Mahogany is one of the traditional furniture woods, known for the straight, smooth, semi-open grain with many cross grains, that accepts a fine finish. It is a bit lighter weight than maple, and comparable to oak in strength. It withstands moisture well, so is popular in wooden boats, entry doors, or other outdoor projects. It is easy to work, with relatively few defects. The color of the wood ranges from yellow brown to dark reddish brown. With age it darkens slightly to a rich dark red-brown. Factory made furniture is often stained much darker than natural, to accelerate aging. Over the centuries mahogany has probably been the primary furniture wood. Much of the current "Genuine" (Honduras) mahogany wood, in the upper picture is plantation grown in Latin America, but even the plantation grown wood, is getting scarce due to the long time-to-maturity for the trees. Many countries have export restrictions because the native trees are isolated, and huge environmental damage is often caused while removing them. African mahogany (Botanical name- Khaya) is a somewhat softer wood than "genuine" Mahogany, but is rated "moderately durable". It was the first common substutute for genuine mahogany, but it, too, is getting scarce. It has a very fine grain, and is sometimes used for paneling. It also looks very much like the Phillipine Mahogany that is sold as luan plywood, although Luan is technically not a mahogany. With limited mahogany (of any sort) available, Sipo is currently a popular substitute, sold by my lumber yard as Sipo-Mahogany, although botanically it is not mahogany. It has most of the good characteristics of mahogany, looks a lot like mahogany, and is readily available at a reasonable price. The second picture is "bare" sipo, and the third picture is sipo with a clear finish. A new species of hardwood has been "invented" by Aracruz Wood Products in the state of Bahia, Brazil, and distributed in North America through a strategic alliance with Weyerhaeuser (see www.lyptus.com.br). Lyptus® is a cross between two different Eucalyptus species, it is germinated in nurseries and grown alongside native forests in Brazil. With a growth cycle of 14-16 years it produces thirty times the volume of comparable rain forest species. It is hand pruned, so the trunks are long, straight, and with few knots when they reach the mill. In terms of density, strength and technical properties Lyptus® compares favorably with hard maple. Unfinished wood is quite light in color, almost pink, as seen in the upper picture, but quickly ages to a deeper red/brown. It can be dyed and finished like the lower picture, to look like mahogany. In fact, I prepared identical pieces of Lyptus® and mahogany; with the same dye, and they were almost impossible to tell apart, but the sample of Lyptus® weighed 1.4 times as much as the mahogany. The price is comparable to other furniture wood, perhaps even on the low end of the range of prices. After an initial surge in popularity, some woodworkers complain bitterly about sharp splinters while working with it, so it's popularity may be fading, now primarily used for flooring. Hickory and Pecan are from the same biological family - in the south the trees are probably Pecan, in the north, the trees are probably hickory. In most of the country the trees cross-fertilize, and could be either. The federal government allows the two woods to be mixed and sold under either name. (After they are cut, an expert says he has to use a microscope to tell the two types of wood apart.) The wood has a variety of colors, from a warm medium brown to a light cream with occasionally deeper streaks - so much variation that it isn't practical to try to match boards of similar color - expect a mixture. Look at this set of furniture for an example. Hickory is one of the heaviest native woods, and some claim it is the first "pure North American" species. The second picture shows a darker piece but illustrates the strong grain pattern. By definition, a hard wood is from a tree that drops its leaves each year (deciduous), and a soft wood is from an evergreen. But some hard woods can be fairly soft, and some soft woods fairly hard. Pine is a soft wood that I do not recommend for furniture. However, many of the classic colonial pieces were pine. The newer pine wood is grown very quickly so is very soft with a fairly coarse grain. Antique pine furniture was made from "first growth" pine wood, which grew more slowly, so is harder. It was often rift cut or quarter cut (less efficient) giving it a much finer grain pattern. Some pine furniture today is made from recycled or recovered "old" wood, to get the denser wood and finer grain. Some specialty lumber yards sell recycled antique pine wood, and even get a premium price for real worm holes. Knotty pine is often used in "Lodge" construction, where the large knots become a distinctive feature. Use of knotty pine for furniture is chancy, since the knots are fairly large (interfering with strength) and often loose. 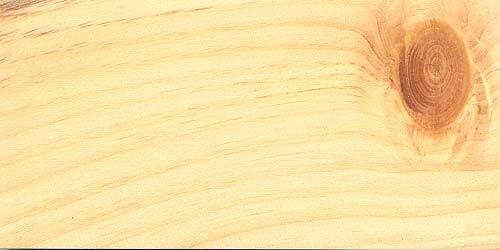 Knotty Alder is similar to Knotty pine, but the knots are generally smaller and tighter. I have built some cabinet doors to go in a Knotty Alder wine cellar, but have concerns about building major furniture pieces with this wood. Both alder and pine are subject to rot, so should not be used outdoors. Cedar is technically a soft wood (an evergreen), but is naturally weather resistant. I have made some indoor furniture with it (not great), but like to use it for outdoor furniture. Finding white cedar boards without a lot of knots is a challenge... sometimes I have had no problem among timbers and beams sold by lumber yards as deck material, that I cut down to size. Other times I have had trouble finding straight, solid boards that I could use. Aromatic cedar is the more highly colored, more aromatic form. It is reputed to repel bugs and moths, so is used to line closets and as the bottoms of some clothing drawers. In this use it must be left unfinished - in fact some of the aromatic oils contain the same "active ingredients" as paint removers, so finishing even the surrounding areas can be a problem. Spanish Cedar is technically not cedar at all, and certainly not Spanish. It is a common hardwood (deciduous) from Central and South America that is used in North America primarily to line cigar humidors. It has the distinctive cedar aroma with the reddish-brown heartwood, and a white or pink sapwood. One sub-species has a lot of sap that can weep in a humidor. This is a popular wood for siding, decks, outdoor furniture, and projects - old growth is very resistant to decay and insects with naturally occurring preservative; new growth heartwood is good but not as good, and sapwood is inferior for outdoor projects. Holds stain well, very durable, even recycled from 100 year old buildings. Cypress has enough of the good features of hardwood that the NHLA (National Hardwood Lumber Association) grading rules apply to "Hardwood and Cypress." These woods are less common, often because they are more expensive. The cost of the wood may be 2 to 5 or more times the cost of the more traditional woods above. Some wood may only be available as a veneer. For an individual piece of furniture or for a key part of a piece (such as "only the table top") or for a decorative element, the difference may be an insignificant part of the total cost. If you like these woods, you should consider them. I don't keep a large inventory of wood - I normally buy the primary wood for each project. The common furniture wood is readily available at predictable prices. The exotic wood will certainly have to be purchased for a project. But the local sources may only have a limited supply, or may not have the necessary pieces in stock. Wood is expensive to ship, especially in small quantities, and even the "mail order" sources for this wood do not always have all sizes in inventory. I love the opportunity to work with a new wood, but if you choose one of these woods for your project, the exact timeframe, and to an extent, the cost, are less predictable. Rosewood refers to over 100 species of tropical woods from all over the world, all belonging to the genus Dalbergia. They are very hard, and the natural oils make them somewhat difficult to glue. Those oils also make this an excellent wood for use with an oiled finish, but it can also have a hard finish such as lacquer or varnish. As true rosewoods become more rare, some vendors substitute the similar narra, from Southeast Asia, or possibly jatoba (AKA courbaril, Brazilian cherry). If you are looking for larger pieces, such as cabinets, think in terms of veneers. Rosewood sawdust is toxic - we must use breathing masks and skin protection when working with it, and it should not be used for cutting boards or other food utensils. In rare cases some people experience a rash from merely touching the wood, even chin-rests on violins. But it sure is pretty. The cocobolo and bubinga below are from the rosewood family. Cocobolo is from the Rosewood family, imported from Central America. Colors range from purple red to yellow with irregular black streaks. With exposure to light over time, colors will darken to a deep orange red. It is very dense, and is often used in musical instruments. It is similar to Bolivian Rosewood (Morado), Santos Rosewood, and many of the other members of the Central American branch of the rosewood family. 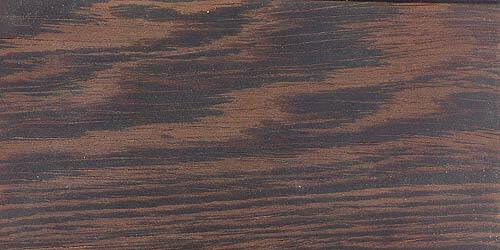 Bubinga is African Rosewood. It has a reddish tint, with brown and black grain patterns, somewhat like a cross between Walnut and Cherry. It is popular among furniture artists. The wood is dense enough that the end grain finishes well. See the humidor that we made from Bubinga, with a somewhat different overall appearance than this picture from the web. The wood burns easily as it is cut and sanded (my problem, not yours). Wenge is also popular among furniture artists. It is yellow-brown when freshly cut, and becomes very dark brown to almost black. The sap wood is yellowish white, and would normally be hidden on the inside. The grain is intense, dense, and relatively straight. It is a very hard wood (harder than oak) that quickly dulls cutting tools and gives woodworkers splinters. The open grain pattern must be filled for a smooth finish. The sawdust is toxic (skin and breathing), so this wood should not be used for food service. Teak is a wonderful durable wood that makes great unfinished outdoor furniture, aging to a beautiful silver-gray, or it holds a fine finish (often teak oil). Sometimes I have been quoted prices so high that you might need a security guard for your lawn furniture, although I once received a price quote "only" 3 times the cost of walnut. I have not always been able to get the wood for a project at an acceptable price (or even an absurd price) so we need to find the wood before we plan a teak project. Someone recently suggested that he had found Iroko wood as a good substitute for teak, and much cheaper. Finished in Teak Oil, it matched other teak items. I have not used it. There can be no question where this wood got it's name! A recent quote was about 3 times the cost of walnut. Some rare pieces of hard maple have a beautiful pattern like these - each "eye" is the size of a pencil eraser, among the clouds. The wood industry has reportedly learned to print this pattern on wood (or plastic) so artificial birds eye maple is becoming popular as an office wallboard. I recently received a quote at only 2 1/2 times the cost of Walnut - far less than I expected. The birds eyes appear through the wood - even more in the darker heartwood, so pieces of light colored maple with dense birds eye patterns are becoming very rare. Ebony is a family of different woods that are very hard and heavy, many of which are quite black. Grain markings are fine and very indistinct. The wood is hard that carbide rather than steel tools normally must be used to cut it, and most is so heavy that it sinks in water. The picture of brown/black wood at the right is Macassar Ebony, also known as French Rosewood (see why I am confused?). The ebony that is "pure black" (think clarinet) is called African ebony. And the black grand pianos are commonly made from maple, with a black finish. African blackwood (not part of the ebony family) is a substitute for ebony - cheaper than ebony, but certainly not cheap. Reportedly blackwood is used for clarinets because of the translucent (shiny) quality and tonal quality, while real ebony (matte black, wears well) is used for piano keys, fingerboards on string instruments, and chin rests, as well as decorative furniture inlays. Walnut is sometimes treated with vinegar that has had steel wool "dissolved" in it. This causes the walnut to turn very dark, looking like ebony - a process called ... ebonization. Since ebony costs 20 times as much as walnut, and isn't always 100% black, this technique has been used for centuries. Some vendors descriptions of their ebony products suggest that much of the "ebony" furniture and pianos are really made from ebonized wood. African Padauk is a deep orange/red color that deepens with age. The sawdust is toxic and stains clothes and other wood. I'm not looking forward to working with this one, but it is strong, dense, and decay resistant, making it a favorite for furniture and boats. Among the exotic woods, it is relatively inexpensive. As I have collected information on other woods, I want to keep that data together, but generally these are woods that I have not personally used. Basswood, also known as Linden, is light, with straight fine grain. This makes it a favorite for woodcarvers, which I am not. Two types of Locust trees are found on the East Coast: Black and Honey Locust. The Black is the more common in the Northeast; the Honey Locust in the South. Very hard, beautiful golden color grain. Used in boat building, fence posts, railroad ties, and poles. I suspect this picture may be showing stained rather than natural wood. Sycamore is known for it's interesting grain patterns and good tone characteristics in musical instruments - it is often used for backs of violins and guitars. In many ways it is similar to maple, although I must have missed the biology class that would allow me to understand the articles about whether or not it is related to maples. I have been concerned about stability, but that problem is apparently overcome by steaming when it is dried. I have some beautiful sycamore veneer waiting for a project. Many of my early pieces were made from birch plywood. Eventually I got some solid birch for frames and edges. It is a hard durable wood, but it lacks character, and is sometimes difficult to stain evenly. The solid wood is too expensive for routine use as a secondary wood, although the birch plywood is common and may be used as a secondary (structural) plywood. Butternut has a good reputation as a wood with an interesting soft golden brown grain pattern, sometimes called white walnut. Reportedly subject to a blight that may make it extinct like chestnut. It tears out when turning UNLESS it has been STABILIZED and when turned must be carefully sanded. Because this wood is less dense and softer than most hardwoods, it is very popular for carving. Much of antique furniture boasted Butternut carvings that were stained to be indistinguishable from walnut. I have not used it yet. ©2004-2011 by Charles A. Plesums, Austin, Texas USA. ALL RIGHTS RESERVED.